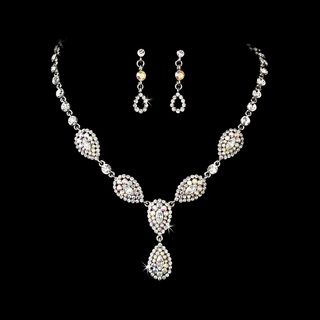 This exquisite, silver-plated necklace and earrings set is sure to dazzle on your special day! Filled with shimmering clear and AB-Reflective rhinestones, this set would be a lovely addition to any classic, modern, or vintage wedding. Size: The necklace measures 16-1/2" long with a 4-1/2" extender, and the central drop falls to 1-5/8". The matching earrings measure 1-1/4" long. home | about us | contact us (e-mail) | ordering info | VIEW CARTCopyright © 2018 A Touch of Class Creations. All Rights Reserved.